If you’ve ever needed to keep updating a template with a running total and finding it difficult to essentially remake your template each time, then this tutorial is perfect for you. The free Running Total Template is a document that will show you all the necessary steps it will take to use the SUM function to keep a running total for your lists, accounts, finances, expenses, etc. This is one of the most useful examples of the SUM function in Excel and it’s extremely easy to learn. All you need to do is download the free template below and follow along with this helpful guide. To learn how to use the Running Total Template, you will first need to download the template file to your computer. 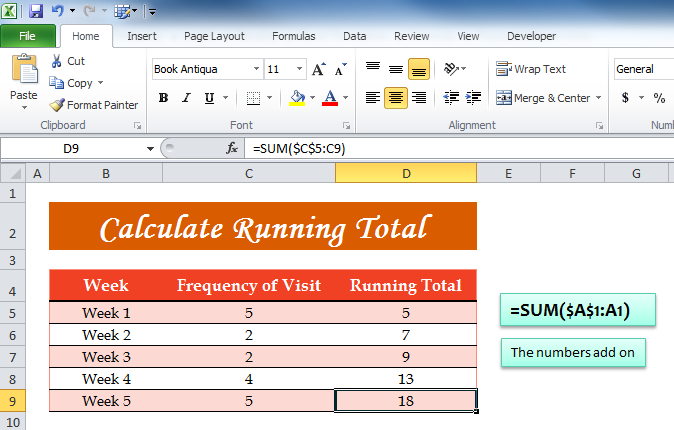 We have provided a very simple example of how the SUM function can be used to keep a running total. For this example, you want to keep track of the number of visits you get for your business. You’re tracking the next 5 weeks to see if your new marketing strategy is working. You can keep a running total because you know that you have to update the information each week. The first step will be to compile your data in an easy to read table like the one displayed in this example. Next, in the “Running Total” column is where the function was applied. Take a look at the formula used to calculate the new total for the first week. You will notice that ranges are set to go from column C5 to C9. That’s really all there is to it. Once you enter the formula into the first cell, you will have the option of dragging it down to apply to future cells as well. When you want to apply the formula to your own document, just replace the range (C5-V) to the relevant range of your own document.